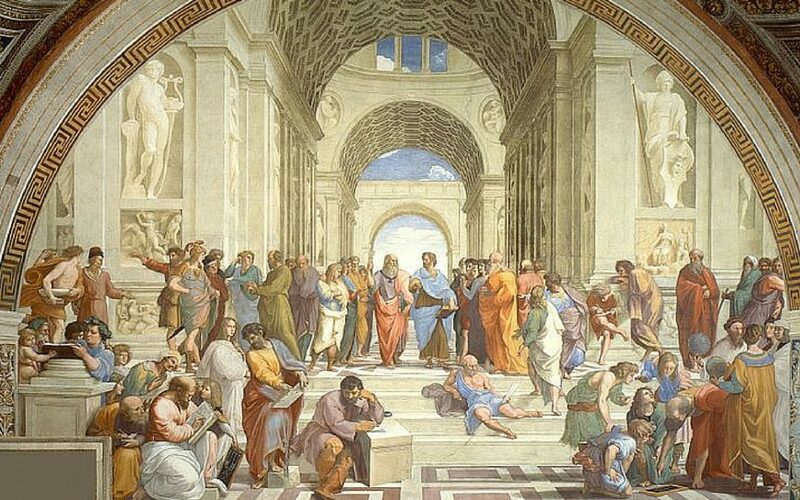 Ancient Greek Philosophy was born in the 6th century BC, and lasted throughout the Hellenistic period. It deals with a wide variety of subjects including political philosophy, metaphysics, ontology, ethics, logic, and rhetoric. Greek philosophers are some of the most famous thinkers of all time, there ideas shaped the world we live in today, and influenced what we believed to be right and wrong. Pythagoras is one of the most famous philosophers, mathematicians and scientist of all time. He was one of the first philosophers of all time, and one of the first known vegetarians. He founded the popular philosophical, religious movement known as Pythagoreanism. He lived from 570-490 B.C. 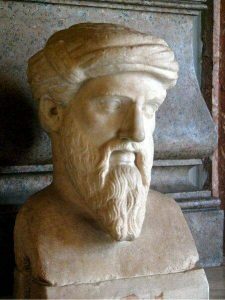 Not much is known about Pythagoras, none of his work survived, and a lot of his followers would would write their own work in his name, making it hard to determine what he actually believed. 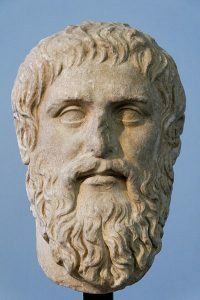 Most famous Greek philosophers influenced other famous Greek philosophers, one of the people influenced by Pythagoreanism was Plato, who was influenced by it significantly. Zeno Of Elea is one of the most mysterious Greek philosophers, and most of what we know about him comes from information found in Plato’s Parmenides. Zeno was mos likely born around 490 BC. One of the things Zeno is famous for other than philosophy is trying to overthrow Nearchus the tyrant. Zeno failed to do so and was captured and tortured. He refused to give up the name of his co-conspirators, but said that he did have a secret which would help the tyrant. When Nearchus leaned in to hear, Zeno bit his ear off, and didn’t let go until he was killed. Zenos was famous for his paradoxes. None of Zeno’s work survived, and a lot of what we know about his arguments comes from Aristotle. Parmenides was one of the pre-Socratic Greek philosophers, but unlike many other Greek philosophers of his time, one of his works actually managed to survive. The only work tha survived was a poem, On Nature, although only part of it remains. 160 verses of the poem survive today, which sounds like a lot but it was only a small fraction of the poem which was probably 800 verses long. The poem describes two views on reality. In one part of the poem called “the way of truth” he explains how reality is one, change is impossible, and existence is timeless, uniform,necessary and unchanging. “Thought and being are the same.” Parmenides. Anaxagoras is praised as the man who brought philosophy to Athens, he was also the first to establish a philosophy in it’s entirety in Athens. Like many other Greek philosophers Anaxagoras often said that things that weren’t politically correct at the time, and dearly paid the price. Anaxagoras was charged with impiety, and sent to live in exile in Lampsacus. Anaxagoras believed that all things have existed in some way from the beginning but originally they existed in infinitesimally small fragments of themselves, endless in number, and inextricably combined throughout the universe. 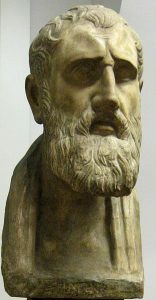 Zeno of Citium is the founder of the stoics, one of the most influential schools of Greek and Roman philosophy. Stoicism paid a great emphasis on goodness and peace of mind. He believed that this could be achieved by conforming to the will of the universe, which he believed to be god. Zeno believed that humans didn’t have any free will, and were directed by the universe. Zeno was born in 344 BC, and died in 262 BC. Zeno divided his philosophy into three parts, Logic, Physics, and Ethics. Legend says that Zenos was once a merchant, who was caught in a shipwreck but managed to survive. He found his way into a bookshop and was attracted some writings about Socrates. He asked the librarian how to find Socrates, and he pointed to Crate of Thebes, the most famous Cynic living at that time in Greece. 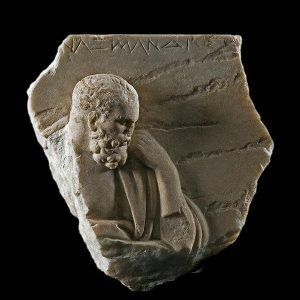 Anaximander was the pupil of Thales and even became the second master of his school, teaching Aaximenes, and Pythagoras. 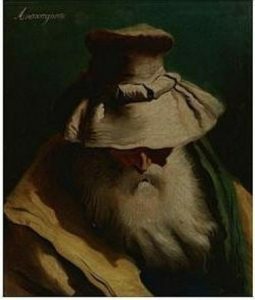 He was the first philosopher to have written down his studies, but even so he is mostly unknown today. He was an early proponent of science and tried to explain different aspects of the universe. He claimed that nature is ruled by laws and that anything that tried to disturb the balance of those laws did not last long. Socrates is one of the most famous and influential Greek philosophers in the world, and credited as one of the founders of western philosophy. Most of what we know about Socrates was written down by his students, Plato and Xenophon. Socrates is famous for his contribution to ethics. Socrates took a rational approach to philosophy and tried to establish an ethical system based on logic. 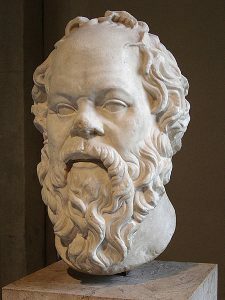 Socrates had many controversial claims, and his offensive ideas eventually lead to his executions. Socrates criticised Athens, and often praised Sparta, he was executed to silence him. He is known for creating Socratic irony, and Socratic method. Plato was a philosopher in ancient Greece and the founder of the academy of Athens. He was Socrates most famous, and influential student. He is often considered the most pivotal figure in the development of western philosophy. Plato is unique among ancient Greek philosophers because his work actually survived for over 2,400 years. He has also been called the founder of western religion and spirituality, in particular spirituality. Plato diverted from his teacher Socrates who interpreted philosophy based on human reasoning, and interpreted philosophy with reasoning, and theology. Aristotle joined Plato’s academy at the age of 18 and stayed until the age of 37. 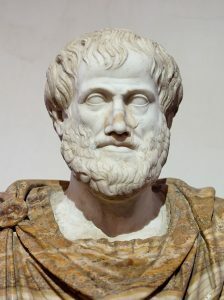 Aristotle interpreted philosophy based on facts that you could learn from experience as you go through life. Aristotle was not only a student of Plato, but also the teacher of Alexander the great. Aristotle was one of the most influential thinkers of all time, and his ideas remained popular for centuries. Tutoring Alexander the Create gave Aristotle an abundance of supplies. He started a library in the Lyceum which helped him produce hundreds of books. Aristotle first followed Platonism, but after Plato died he changed to empiricism. Thales Miletus was born in 620 BC, and died in 546 BC. He was known as one of the seven sages of ancient Greece. 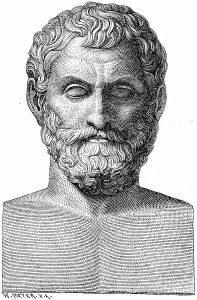 Thales was the father of ancient Greek Philosophy, and the founder of the school of natural philosophy. Thales is known to be the first person in known history to have engaged in scientific thought. Thales was one of the first people to stop trying to explain the world through mythology, and instead explain it through science. One of Thales theories was that earthquakes were not caused by the gods, but that the earth was floating on the water, and an earthquake happens when the earth is rocked by a wave.